When I was little, the best part of my summer vacation was when my Dad would take us out to Long Island for a couple of weeks on the beach. Literally, it was the highlight of my year! And these vacations were 100% family time. We ate, played, relaxed, and enjoyed each others company without any distractions. Once in awhile my Dad would call the office..I think..but there were no screens, tablets or pads in tow. Our rental cottage had no Cable or TV. Rather, we woke up early and had fried eggs and bacon or Capt. Crunch cereal then headed straight to the beach, only steps away, for a day of riding the waves, making “ball runs” and taking in as much of the summer sun while it lasted. The only two mandatory things: Complete our summer reading requirements and make our own Schmores. Playing in the waves, running through the dunes, tennis, steamers & lobsters, lemonade stands, watching for shooting stars, Baby Bat Kites, Mini Golf, soft serve ice cream at John’s and a race home on the hilly old Montauk Highway with Dad at the wheel of his sporty Datsun and our summer was complete; minus dozens of other memories that made our time in Amagansett so special and memorable. At the end of each day we were exhausted and sleep came easy, but our minds and imaginations raced with excitement in anticipation of the next morning and another day on the beach. What we didn’t have: Pads, Tablets, or Screens. What we did have was an amazing time together! When our cousins came too, it was even better! One of the first questions I am asked when guests arrive at Cristal Azul is, “Is there Internet or Wi-Fi here?” For the first few years the answer was no, we could not offer it and guests quickly forgot that they needed it after a dip in the pool and a few hours at Cristal Azul. The Rancho is fully equipped with a professional pool table (a gift from a sponsor of “The Black Widow” for hosting her at Cristal Azul) and plenty of puzzles and brainteasers, enough to keep even the restless spirit in endless pursuit of solutions! A private bar is set up exclusively for guests and our chef is always close at hand in case you want a quick snack or sit down gourmet meal. Hammocks abound, decks have comfy day beds and the vanishing edge pool is a favorite for all who visit to take in the amazing, endless views that are enjoyed while here. Day trips and light adventure are all in the direct area or about an hour away and at the end of the day you have your own full service, private retreat to return to. Add a family looking for a good time and nothing can go wrong with this picture. But it did. Once we did set up a Router in the Rancho, things quickly changed. Suddenly, guests HAD to check work email. Honeymooners HAD to check Facebook to scan for guest pictures. Teenagers HAD to check–in with girl/boyfriends. Tablets were at the table, conversations were not. Laughter was replaced with silence and what was was very interesting; guests who connected to the web and hung out there while on vacation often did not leave comments in our guest book. Hmmm, very interesting indeed! It was sad. I understand the need to check-in. We do so ourselves when on vacation. But there were some guests that just could not disconnect from technology and their lives online. 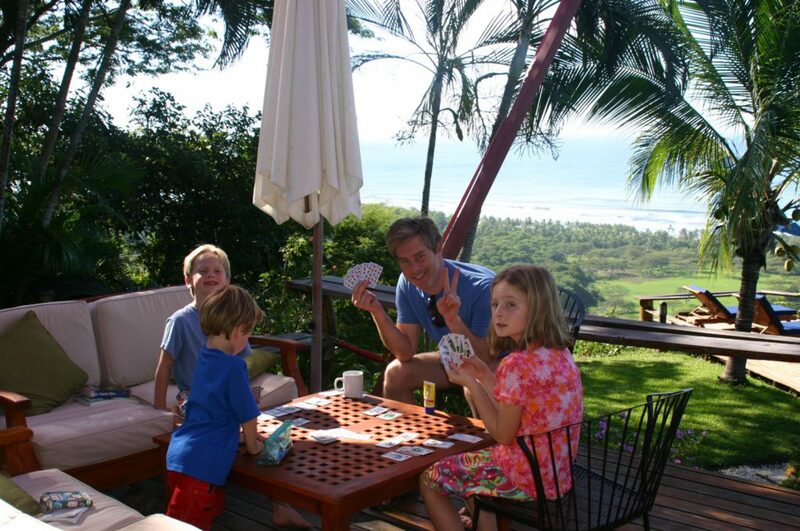 So much was missed out on…time on the beach, monkeys, parrots, funny little lizards and frogs, breaching whales..(not too mention: great family conversations, jokes, learning about a different culture, trying new things) lots of good, old fashioned, family bonding-memory creating fun! Thanks to my husbands weather station, we now need the Router in the house 24/7 and offer our cell phones “hotspots” when we are with guests in the rancho for breakfast and dinners. And as one would expect, things have returned to normal and days are filled with playing either up on the hill poolside, down on the beach, or taking in the local tours and culture! Rather than being asked for the WiFi I am asked how to solve one of Henner’s incredibly difficult and insanely frustrating brainteasers or if it’s possible for one more surf lesson! I love it. It’s why we do this. Creating memories that will last forever and sharing this hidden gem in paradise with those who like to stray off the beaten path. So please, leave those tablets at home (or in your Cabina) and come visit us in paradise if you want an old fashioned good time on the beach! Come play, discover, disconnect from technology and enjoy the ones you love without any distractions! Do not forget to enjoy each other and the fun had by just being present and in the moment. You won’t remember every post or funny video you saw on vacation in your older years, but you will hold on dearly to those adventurous, fun, memorable moments you spent at Cristal Azul with your loved ones for sure!